Biotech billionaire Patrick Soon-Shiong took over Monday as the new owner of the Los Angeles Times and immediately named respected journalist Norman Pearlstine as top editor. The changeover aims to reinvigorate what had been one of the leading US dailies until it fell on hard economic times in the digital era and saw a rise in newsroom unrest. "From today, our important work protecting and building on a rich history of independent journalism begins—with a sense of urgency and purpose," said a note to readers by Soon-Shiong, who agreed to pay $500 million and assume $90 million in pension liabilities to acquire the daily from the newspaper group Tronc. The new owner's first move was to name as executive editor Pearlstine, 75, who has worked at The Wall Street Journal, Time Inc. magazines and Bloomberg News in a 50-year career. "Not only does he have amazing experience with the full knowledge of how a newsroom runs—but he's amazingly modern and forward-looking," Soon-Shiong told the newspaper. "There's no agenda, other than to make this the best journalistic institution." Soon-Shiong, a surgeon whose biotech investments have boosted his net worth to some $7.5 billion, reached the deal earlier this year to take over the Times and The San Diego Union-Tribune, operating under the California News Group. He becomes the latest billionaire aiming to revive the fortunes of ailing US metropolitan newspapers, following Amazon owner Jeff Bezos's takeover of The Washington Post and investor John Henry's deal for The Boston Globe. He reached the deal after months of newsroom unrest at the storied Los Angeles daily that saw three editors in the past six months and a vote to unionize the journalists. 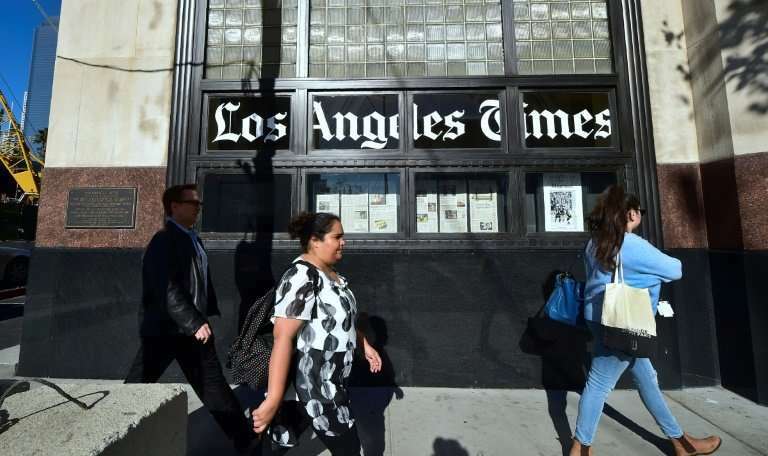 The LA Times, like many newspapers, has been downsizing its staff as readers turn away from print to online news platforms. The Los Angeles daily was family-owned for more than a century before being sold to the Chicago-based Tribune Co. in 2000. Tribune Co., which split off its broadcast division and renamed its publishing arm Tronc (for Tribune Online Content), will continue to own the Chicago Tribune, Orlando Sentinel, South Florida Sun-Sentinel, Baltimore Sun and New York Daily News. Soon-Shiong, born in South Africa to Chinese parents, has been an investor in Tronc and also owns a stake in the Los Angeles Lakers basketball team. He has been a faculty member at the UCLA medical school and has invested in and donated to medical research.